Life can be tough for bears living in the remote Alaskan wilderness, each one locked in an endless struggle for survival in a land rife with dangers. 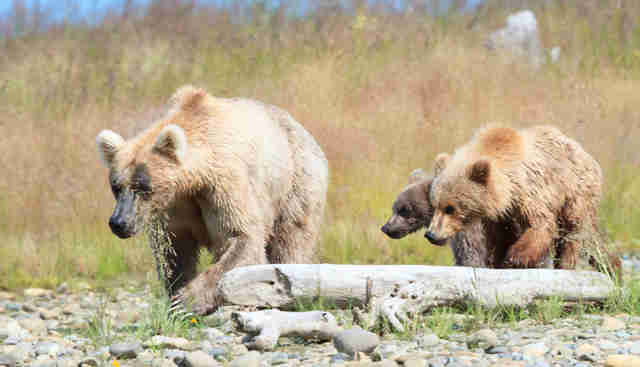 Early last July, rangers in Katmai National Park and Preserve in southern Alaska observed that a yearling bear cub appeared to have been abandoned by his mother. It's unusual for a mother bear to leave her offspring at such a young age, and the yearling was far from prepared to find food or defend himself from other bears, but still the rangers could only watch as nature took its course. Over the next few weeks, the orphaned yearling remained mostly out of sight, perched in a tree near the river where his mother had left him. At the time, National Park Service ranger Michael Fitz noted that without his mother, the yearling's chances of survival were slim. "It faces an uphill battle to survive this summer," Fitz wrote. But just a few weeks later, in late July, park officials saw something that intrigued them. 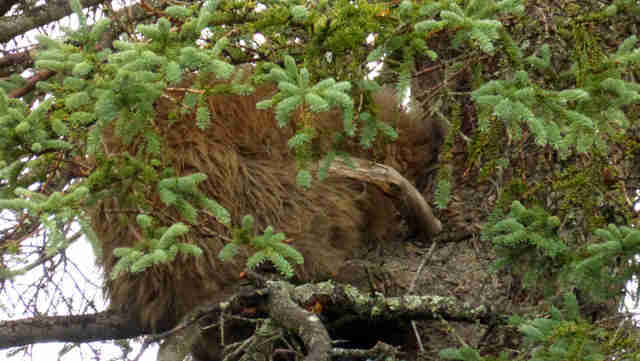 A visitor had snapped a few photos of a mother bear with two cubs taken in another region of the park. Rangers recognized the yearling immediately, but were surprised to see that he was in the company of a different mother bear, known as Holly, along with her own young cub. Mother bears accepting outside cubs into their family units is almost unheard of, so Fitz was justifiably dubious about what the images suggested. "I was unwilling to conclude from these photos that an adoption had occurred. After all, Holly could've been merely tolerating the yearling's close proximity and adoption in brown bears is very rare," he wrote. As the weeks passed without another sighting of the yearling or the family he'd been seen with earlier, Fitz's curiosity about their possible arrangement grew. In the first week of September, the yearling was seen yet again with Holly and her biological cub, and their manner seemed to show without a doubt that the mother bear had come to consider the orphan one of her own. Holly has been seen sharing food with the youngster, sleeping by his side and nuzzling him just as his real mother might have. "We don't know what circumstances brought the yearling and Holly together. Holly is generally tolerant of the close proximity of other bears. Perhaps the yearling stumbled upon her and found she didn't react defensively. Perhaps the yearling remembered her tolerance from interactions along the Brooks River. Whatever happened, the yearling found the right bear at the right time," wrote Fitz. "We will never know Holly's motivation in this situation. I'll ponder these questions, even if they don't have an answer, but adoption is rare in the bear world. The adaptability of bears and the surprises they provide are [what] will motivate me to keep watching and learning."